If you’re considering applying for a job, then you must check your resume, usually resume consists of a CV, a cover letter and portfolio. So take some time to craft a visually engaging resume, and position yourself to stand out as applicable. We have hundreds of creative resume templates design by professional graphic designers and agencies. Browse through our professional designs. Find just the right one you need to land that new job in style and level-up your career. The professional Resume/ CV Templates are made in Adobe Photoshop and Illustrator and converted into MS Word. If you can use MS Word like a beginner, then you can professionally edit this clean Resume/ CV to suit your needs. 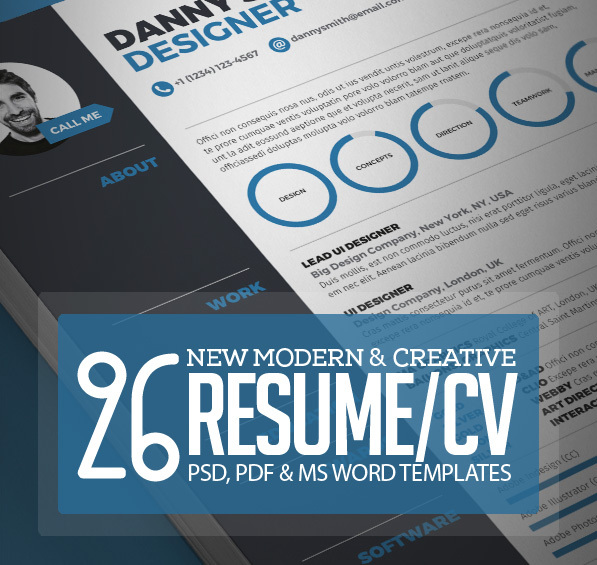 All design CV / Resume Templates available in Photoshop format, instant download. These CV / Resume templates are very helpful to make your online CV and Resume professionally. All template are perfect for photographers, designers, and developers with easy to customize fully Photoshop layered PSD files. If you’re applying for a creative position, or want to stand out from job applicants visually, this modern resume is a distinctive option. It has a minimal design with a clean box and bold line style which punctuates your job history and skills. In addition to a resume, cover letter, and references pages, this design pack also includes a portfolio page for displaying your work. It comes in A4 / US Letter size. Also, the files come with both InDesign (INDD) and MS Word template options. This minimal concept, with clean cut design is made to help land you that creative job and elevate your career progress. You can even use this as a PDF portfolio to help land gigs as a freelancer. It’s as much a creative booklet as a resume. It comes with InDesign and Illustrator files. It’s print-ready and has 17 pre-made color options. Make use of this fully-loaded pack today! 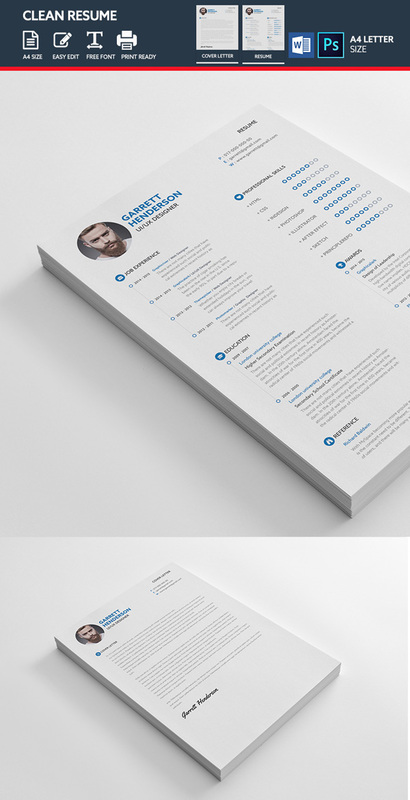 This is a professional resume template set with two dynamic portfolio page options. You can impress new clients or potential employers by showcase your best work samples. Provide three large thumbnails with titles and detailed descriptions. This is a beautiful modern resume design. It has a flat web style, with understated highlighted white boxes, set against a mid-gray background. If you’re a marketer, digital creative, or web professional, this is a resume template design to take notice of. This responsive resume design is a big pack with 80 files in AI, EPS, PSD, DOCX, and DOC formats. It’s professional and easy to edit with your details. Includes: resume, cover letter, thank you card, business cards, icons and more. This is a modern resume with a unique style that features icons, flat graphics, and infographics to visually engage potential employers a a creative applicant. This high-energy resume design comes with Photoshop, Illustrator, InDesign, and MS Word files. It includes resume, cover letter, portfolio page, business card templates, and distinctive design features. This simple resume is designed for creatives. It has basic infographics, like timelines and visual skill displays, as well as a portfolio page to display your best work, in addition to the resume and cover letter pages. It features a clean, boxy design that puts your work and experience first. It’s setup to easily change colors and customize in Photoshop, Illustrator, or MS Word. The Resume template is clearly organized and labeled so you can be confident in getting the best results in the fast possible time. 3 different colors, Easy to change Color, Well organized and named layers, Easy to edit and fully customizable and also Editable in MS Word. 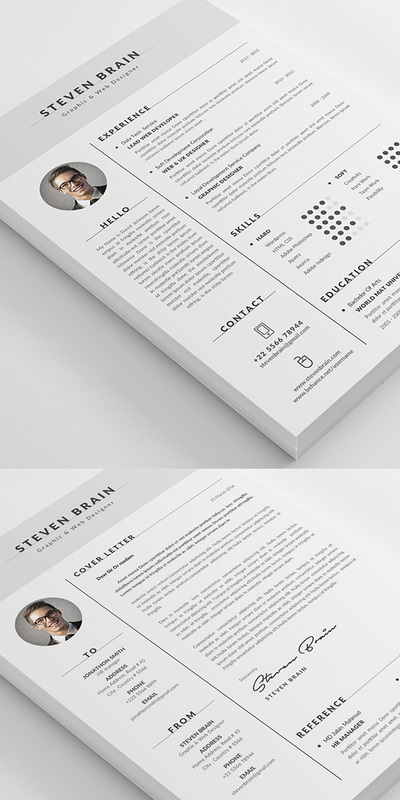 Circles European Resume is a modern resume template designed with a minimal and Clean Style. Very Easy to use and customize.